Optical network operators worldwide are faced with a tremendous challenge – expanding their networks to keep up with massive traffic growth and doing so profitably. In 2012, Cisco’s Visual Networking Index (VNI) projected network traffic would quadruple between 2011 and 2016 to 1.3 zettabytes or 1.3 trillion Gigabytes annually. Video will continue to grow and eventually consume a 55% share of network traffic. Likewise, mobile traffic will grow 18x, driven by the transition to HSPA+, LTE, and LTE-Advanced. Market research firms project that by 2015, optical spending will increase 25% over the $12B spent in 2010 as carriers prepare to build out their metro and access networks to deal with the massive increase in Ethernet and packet traffic. What will the new metro network look like and what capabilities will be required? 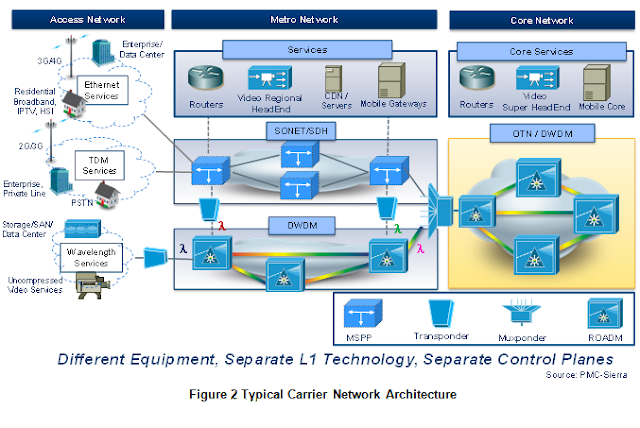 Before exploring these questions, let’s review the architecture of today’s typical carrier network. In the access network, TDM services (T1/E1 private line, ISDN, voice, 2G wireless) dominated until only recently. The last few years have seen dramatic changes in the access service landscape with Ethernet replacing T1/E1 for both enterprise and mobile access. At the same time, demand for native Video and Storage Area Network (SAN) transport has accelerated, adding to the service mix that carriers must support. Meanwhile, outside of China, Layer 1 transport in the metro continues to be largely SONET/SDH based. Today, carriers aggregate client traffic into SONET/SDH (generally at 10G). The resulting OC-192/STM-64 signal is then fed into a transponder which converts the 10G client signal into a 10G wavelength using first generation OTN (ITU-T G.709 Optical Transport Network) equipment. At this point, the signal is ready for transport over the ROADM based DWDM infrastructure. As a result of these challenges, carriers are preparing to deploy a new metro network. The next section explores the coming Metro Transport Network evolution. Offers a simple to manage Layer 1 network that extends end-to-end. Today, carriers have broadly deployed OTN as the basis for their DWDM core networks and it has proven an effective technology in providing both the management, protection, and reach extension required in the core network. 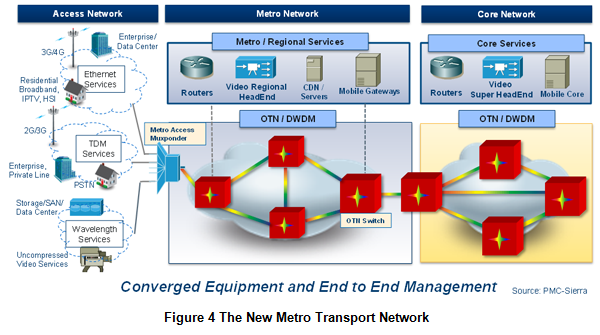 The desire for continuity at layer 1 between the core and metro networks made OTN a primary candidate for the Metro transport network as well. However, OTN technology, as originally deployed in the core, fell short in terms of efficiency of Ethernet transport, and switchability. Nevertheless, the G.709 standard has evolved to become a highly efficient transport technology for Metro applications, with the result that OTN is the nearly unanimous choice of carriers globally to base their Metro networks. 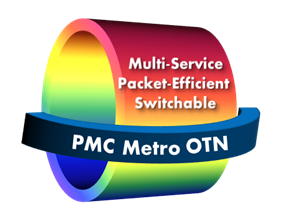 PMC refers to this evolved OTN technology as Metro OTN. Let’s look more closely at how well OTN meets the needs of the new Metro network. By virtue of this capability, and when coupled with Carrier Ethernet features such as IEEE 1588v2 (Precision Time Protocol) and Synchronous Ethernet, OTN is ideally suited for the quickly growing mobile backhaul market. Now, Ethernet is not the only client in the metro. SAN services such as Fiber channel and Infiniband are commonly used for datacenter to datacenter interconnect. Uncompressed HD and SD video streams are increasingly used in video contribution networks due to their superior quality and low latency. Prior to OTN, these bit and timing transparent services would generally be transported directly over DWDM but did so at the expense of reduced or no manageability. 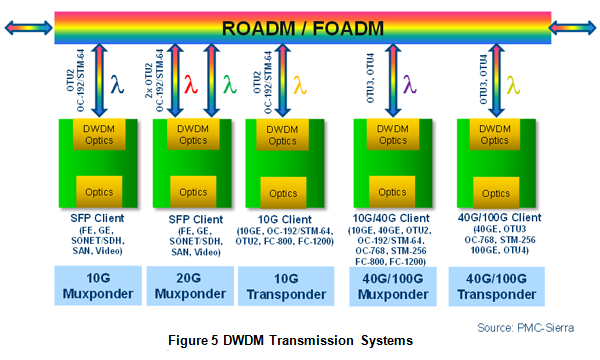 OTN provides the bit transparent transport these services require coupled with enhanced end-to-end OAM that includes 6 layers of Tandem Connection Monitoring (vs. the single layer offered by SONET/SDH). Furthermore, there remains a tremendous installed base of SONET/SDH with new deployments still expected for at least the next 5 years. 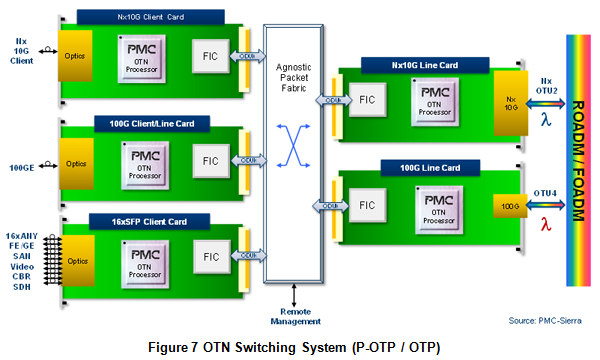 OTN was designed to accommodate both asynchronous and synchronous mapping of OC48/STM-16 and OC192/STM-64 clients. In this manner, OTN can provide the means for the bit and timing transparent transport of SONET/SDH, whether point to point or ring based – and importantly, without the need for PWE3 or CES. In contrast, Metro OTN naturally supports Ethernet, and unlike SONET/SDH does so with a single ODU container to provision, switch and manage. This greatly simplifies provisioning and management, ultimately leading to reduced OPEX. Furthermore, as Ethernet scales in the future, so will OTN. With the development of Metro OTN, carriers can now efficiently map GE into the new ODU0 container operating at 1.25G – right sized for GE. The GE may be mapped in a bit and timing transparent manner for private line service, or may be MAC terminated for managed service delivery. Figure 6 illustrates that in comparison to 1st generation OTN, Metro OTN will double the efficiency of GE transport. Figure 6 also illustrates how the new variable rate ODUflex container drives efficiency gains for other common metro access clients. Take for instance 3G-SDI. In 1st Generation OTN equipment, this video client was at best 30% efficient when transported using a 10G ODU2 signal. ODUflex enables a container to be assigned that closely matches the client rate. ODUflex can also be used to transport subrate 10GE signals, which has the power to open up new private line service options for enterprises and revenue streams for carriers, while at the same time allowing the carrier to efficiently use its fiber resources. Furthermore, each ODU container contains all of the OAM flexibility that OTN is known for. The new ODU0 and ODUflex containers are also switchable. 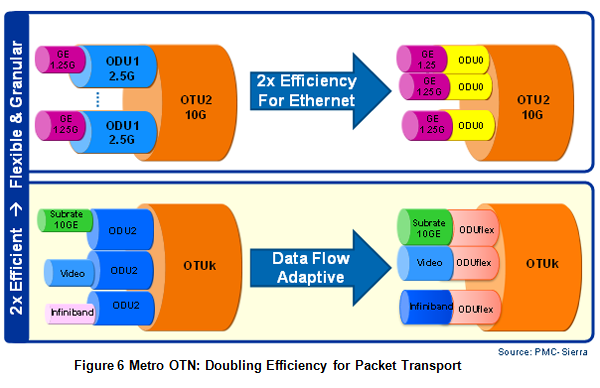 Let’s explore the final aspect of Metro OTN: the support for flexible, granular and distributed OTN switching. The vast majority of access services are sub-10G, with GE the access currency of choice for broadband and enterprise access. At the same time, the metro network is generally built around 10G wavelengths, with carriers preparing for broad deployment of 40 and 100G wavelengths in the metro. As a result, the gap between client rate and wavelength bandwidth is increasing. In recognition of this trend, early OTN deployments were based on muxponders which multiplex client signals into a single outgoing OTU2, OTU3, or OTU4 as shown in figure 5. Muxponder based compact metro access solutions are ideal for aggregation of mobile, broadband, and enterprise services, and are a growing trend among equipment vendors and carriers alike. In a fiber-rich access network, muxponders can cost-effectively provide bit and timing transparent mapping of SONET/SDH, Ethernet, SAN, and Video into grey or colored OTN signals. However, when used in multi-slot / multi-wavelength systems deeper in the metro and the core, muxponders and transponders can lead to inefficient wavelength utilization as a full wavelength must be assigned regardless of the total client bandwidth. Client Add / Drop and Continue is also hindered by the inflexible nature of Muxponder/Transponder architectures. Only clients that are physically connected to a particular board can be mapped into that boards specific outgoing wavelength. This leads to a more complicated service provisioning and management model. For example, if a client needs be moved from one muxponder to another (in order to be transmitted on a different wavelength), human intervention is required. This inflexibility leads to increased OPEX for the carrier. Metro OTN addresses these challenges through the deployment of OTN switching systems. Unlike SONET/SDH, OTN imposes no limitations on switching granularity. All ODUs may be switched between any ingress and egress line card through a cell, TDM, or off-the-shelf packet fabric using the new OIF OTN over Packet Fabric format. The deployment of an OTN switching system in the metro is a critical requirement if carriers are to achieve the most efficient use of their network resources at the lowest possible OPEX. These features enable the equipment vendor to address all present and future requirements imposed by Metro OTN while minimizing total cost of ownership. Compatible with the core network, providing end-to-end Access-Metro-Core continuity for flexibility, protection and management. With this new class of equipment, carriers can achieve reduction in OPEX and CAPEX necessary to enable profitable scalability to support the upcoming 4x growth in network traffic. As a Product Line Manager in PMC-Sierra’s Communication Products Division, Scott Wakelin has helped define some of the industry’s most successful communication semiconductor solutions including PMC’s HyPHY, TEMUX, and FREEDM product families. Currently focused on packet-optical transport solutions, Mr. Wakelin has over 12 years of experience delivering OTN, SONET/SDH, and Ethernet products to market. Mr. Wakelin holds a Master of Applied Science degree in network infrastructure and security. PMC (Nasdaq: PMCS) is the semiconductor innovator transforming networks that connect, move and store big data. Building on a track record of technology leadership, the company is driving innovation across storage, optical and mobile networks. PMC's highly integrated solutions increase performance and enable next-generation services to accelerate the network transformation. For more information visit www.pmcs.com. 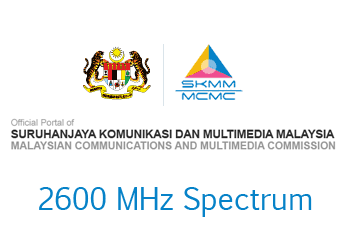 The Malaysian Communications and Multimedia Commission (MCMC) has allocated the 2600 MHz spectrum band for 4G LTE services. 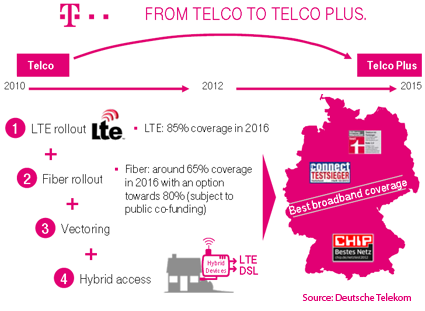 Deutsche Telekom will increase its capital expenditures over the three years to around EUR 9 to 10 billion per year. The focus is on Germany, where DT will accelerate the building out of its LTE network as well as rolling out optical fiber and vectoring technology in the fixed network. On top of that, a hybrid solution is planned for launch that combines LTE and vectoring, thereby increasing bandwidths. In the U.S., T-Mobile USA will roll-out its national LTE network. T-Mobile USA reached an agreement with Apple to offer the iPhone for the first time. "Hesitation now means playing catch-up later. We are investing in the future – with resolve and a clear strategy," said René Obermann, Chairman of the Board of Management of Deutsche Telekom, speaking at the company's Capital Markets Day in Bonn. "The investment plans we have presented today will lay the foundation for future growth. And it is the people in Germany in particular who will benefit more than ever from the modern infrastructure." The acceleration of the LTE build-out will bring coverage to 85 percent of the population covered by 2016 with data transmission rates of up to 150 Mbps. The build-out of the optical fiber network (FTTC) to cover around 65 percent of the population within the same time frame. Deployment of the new vectoring technology, provided a corresponding regulatory framework is in place, will increase VDSL data transmission rates to up to 100 Mbps. Hybrid-box technology will feed traffic in both directions via vectoring and LTE. This will make download speeds of up to 200 Mbps possible and upload speeds of up to 90 Mbps. Investments in Germany from 2014 through 2016 are to increase to EUR 4.1 to 4.5 billion, respectively, compared with an average of EUR 3.6 billion in the preceding three years. In the United States, capital expenditure of around USD 4.7 billion has been planned for 2013 and around USD 3 billion in each of the two subsequent years compared with USD 2.7 billion per year on average from 2010 to 2012. DT issued free cash flow guidance for 2013 of around EUR 5 billion from which a dividend of 50 euro cents is to be paid out both in 2013 and in the following year. Free cash flow of around EUR 6 billion is targeted for 2015. Adjusted EBITDA is forecast to be around EUR 17.4 billion for 2013. In addition, T-Systems' newly launched Telekom IT unit, which pools all of the Group's internal IT activities in Germany, is expected to reduce the Group's IT costs by EUR 1 billion by 2015. In external business, T-Systems is focusing even more squarely on cloud-based solutions. AT&T has formed a strategic alliance with Akamai Technologies to deliver a global suite of content delivery network (CDN) solutions to companies. Under the deal, Akamai will deploy CDN servers at the edge of AT&T's IP network and in AT&T facilities throughout the United States. AT&T will transfer its existing CDN operations, customers and service to the Akamai platform in 2013. The companies have also agreed to dedicate shared resources including technical support, customer care, marketing and professional services support. Financial terms were not disclosed. The companies said the combination of AT&T's network assets with Akamai's CDN will help enterprises simplify content distribution management and drive higher-performing end user experiences for consumers accessing content on the Internet. They hope to expand their efforts internationally within 12 months. Separately, Akamai announced the acquisition of Verivue, a privately-held company based in Westford, Massachusetts that provides licensed content delivery network (CDN) infrastructure solutions for network operators. 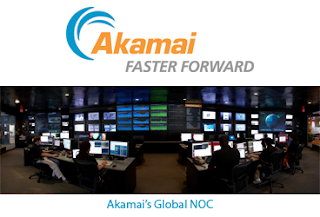 The combination of the two companies’ technologies and teams is expected to help Akamai accelerate market availability of a comprehensive portfolio of Operator CDN products. In November, Akamai announced a partnership with Orange Business Services. Specifically, Orange will begin selling enterprise content delivery network (CDN) services using Akamai Technologies' optimization and acceleration solution. Orange Business Services will market these solutions initially in France. The companies have formed an innovation steering committee to identify areas of innovation in the field of CDN solutions. Cloudera, a start-up based in Palo Alto, California, closed $65 million in new funding to support its Apache Hadoop-based data management software and services. The company cited rapid growth over the past year, both in terms of customers and volume of data under management. 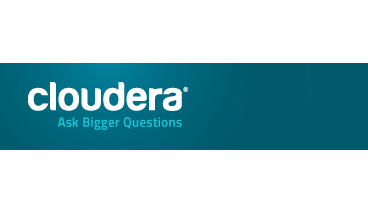 Cloudera's customer base includes more than half of the Fortune 50, and includes companies such as AOL, CBS, EBay, Expedia, Experian, JP Morgan Chase, Monsanto, Morgan Stanley, Network Appliance, Nokia, RIM, and The Walt Disney Company. The latest funding round led by Accel Partners, with support from Greylock Partners, Ignition Partners, In-Q-Tel, and Meritech Capital Partners. "Big Data continues to fuel significant new business opportunities and revenue streams for our enterprise customers, spurring the need for new, large-scale data management solutions that can meet the needs of today's demanding enterprise workloads," said Mike Olson, CEO at Cloudera. "This new investment will speed the expansion of our sales and support operations to meet increasing enterprise demand for our real-time, Hadoop-based platform, as we scale to address the enormity of this global market opportunity." Harris will sell its Broadcast Communications business to an affiliate of The Gores Group $225 million. Harris Broadcast supplies a full line of workflow, infrastructure and networking tools for broadcasters. The Harris product suite includes next-generation routers, processors, master control and branding systems, multiviewers, video servers, network monitoring and control, broadcast graphics systems, test and measurement tools and video networking systems. Harris also supplies analog and digital television and radio transmission systems, along with media management hardware and software. 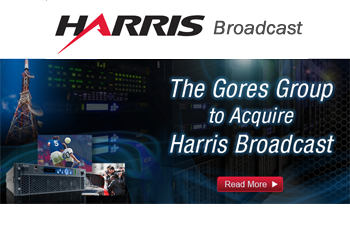 "The sale of Broadcast Communications reflects our strategy to optimize our business portfolio and focus on our core businesses," said William M. Brown, president and chief executive officer of Harris. "As previously communicated, we plan to repurchase up to $200 million of our shares after the deal closes. This is in addition to the $200 million of share repurchases already planned for fiscal 2013 and reflects our ongoing commitment to effectively deploy capital, including returning cash to shareholders." The Gores Group is a global investment firm focused on acquiring controlling interests in mature and growing businesses. BT Openreach will slash the wholesale rental price of its ultra-fast 330Mbps Fibre-to-the-Premises (FTTP) service by 37%. The wholesale service currently costs £60 a month but it will fall to £38 a month from June 2013. The company also announced the lower price will apply to the new Fibre-to-the-Premises on Demand (FoD) service that Openreach will launch and begin to make available in Spring 2013. In addition, BT said the 330 Mbps service will be available across the whole of BT's fibre footprint for the first time and not just from those exchanges that currently offer FTTP. As Openreach has previously indicated, CPs will be charged a distance based construction charge for FoD due to the extra work involved in providing a direct fibre connection. "Our fibre plans are going very well. 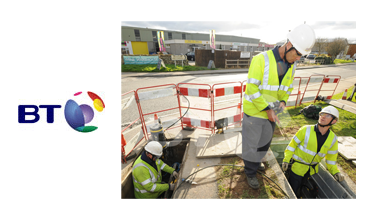 Our deployment is one of the fastest in the world and our services are proving very popular with the public," stated Mike Galvin, Managing Director NGA, Openreach. Verizon Communications declared a quarterly dividend of 51.5 cents per outstanding share, unchanged from the previous quarter. Verizon has approximately 2.7 million shareowners and approximately 2.9 billion shares of common stock outstanding. The company made $3.9 billion in dividend payments through the first three quarters of 2012. 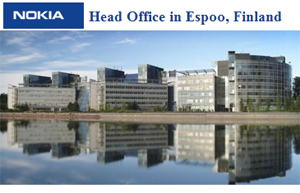 Nokia will sell its headquarters in Espoo, Finland to Exilion, a local real estate management trust, for EUR 170 million. Nokia will then lease back the building on a long-term basis. The 48,000 m2 building has been Nokia's head office since 1997. "We had a comprehensive sales process with both Finnish and foreign investors and we are very pleased with this outcome. As we have said before, owning real estate is not part of Nokia's core business and when good opportunities arise we are willing to exit these types of non-core assets. We are naturally continuing to operate in our head office building on a long-term basis," said Timo Ihamuotila, CFO, Nokia.